Kata Philippines has announced on their Facebook page that a new Android smartphone offering is on its way, the Kata i3L. 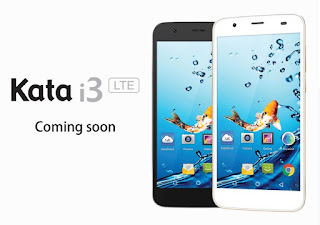 The Kata i3L is the second device from Kata to sports LTE connectivity, the first one was the Kata M2L. In terms of specs, both phones have almost identical internals, 64-bit quad core processor coupled with 1GB of RAM and 16GB of internal storage expandable up to 32GB. As far as I know, the chipset used is also the same, MediaTek MT6735P that has 4 Cortex-A53 cores clocked at 1.3GHz each and ARM Mali-T720 as its graphics processing unit. Other specifications are pretty much the same too, dual SIM capability, 13MP main camera, 8MP secondary shooter, IPS capacitive touchscreen display and runs on Android 5.1 Lollipop. The main identifier between them is the screen size, the M2L has 5.5-inch while the Kata i3L has a slightly less diagonal measurement, which is just 5 inches. No mention yet about the pricing and availability, so please kindly keep visiting our blog for more updates.